Photo: E. Landor, Ealing, from Diseases of The Cat (1907) by Woodroffe Hill. Courtesy of The Harrison Weir Collection. 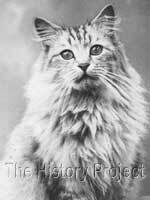 'Mowgli' is a cat, which if he had not been the sire of Miss Frances Simpson's beloved 'Cambyses', might very well have flown 'under the radar' so-to-speak in historical terms. 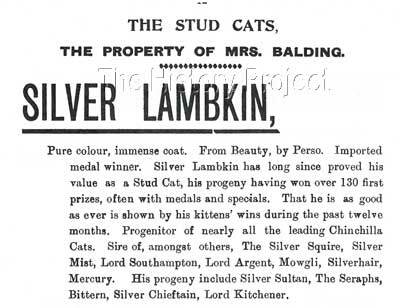 He was an extremely valuable male, being one of an exclusive club of silver males sired by the immortal 'Champion Silver Lambkin', who is generally referred to as 'the father of the Chinchilla' variety. Counted among his most famous sire-siblings, were 'Lord Southampton' (bred and owned originally by Mrs. Greenwood, then later the property of Lady Gertrude Decies) and 'Lord Argent', owned by Mrs. Florence Champion. Both of these males, feature heavily in the expansion of the breed, and many silvers from the period were line-bred based upon various combinations that included doubling either directly on 'Silver Lambkin' or his mother 'Beauty of Bridgeyate', or one of the sons of 'Silver Lambkin', and most particularly his son, 'Lord Southampton'. This of course, produced a myriad of silvers, but many of them were small, poorly boned and some were poor producers. The above commentary was written by Miss Frances Simpson, whom we may surmise could have harboured a little bias in favour of 'Mowgli' as the sire of her beloved 'Cambyses;, but the tenor of her commentary is none-the-less based on fact. 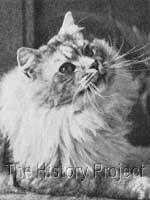 'Mowgli' did appear to have a better head and to be a larger more substantial cat, and his son 'Cambyses' was known to weigh in the vicinity of 11-12 lbs. 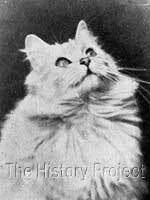 'Lord Southampton' was indeed sold to Lady Decies, for what was then, the highest sum paid for any pedigreed cat in Great Britain, some £60 sterling. 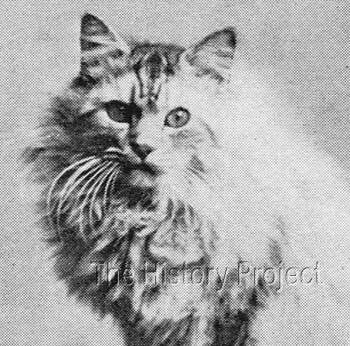 From his entry in the Studbook of the National Cat Club we find that 'Mowgli' was born on the 11th June, 1897 (NCC:3084)1. His breeder was Mrs. Dunderdale, and he was out of her queen 'Sheila'. 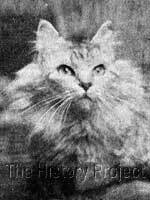 The register however, does not indicate either the colour of 'Sheila' nor her background, but she is presumed to have been a silver, possibly a shaded silver or a silver tabby. His ownership however is clearer, with Mrs. C. Dean (of Hawthorne cattery fame) and Mrs. Smyth listed as his joint owners. As a son of the famous 'Silver Lambkin', 'Mowgli' was in very elevated company. The list of progeny from 'Silver Lambkin' is long, he having stood successfully at stud for many years and living into his 17th year! (1889-1906). It contains, both in its primary ranks and in the subsequent generation, a veritable 'who's who', in the world of the Chinchilla Persian cat. 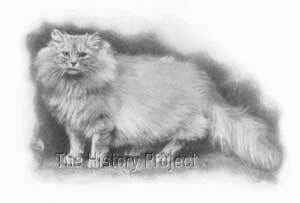 It reads akin to a list of a feline Royal Family, and in some respects, the lines were treated with similar deference by those who were serious fanciers of the Silver Persian variety. In short, they treated the 'Chinchilla', as a 'breed apart', and this was to become even more the case as time went by. Due to the fame and popularity of his sire, the number of sire-siblings for 'Mowgli' is formidable, and certainly too many to realistically be fully listed here. But from among the sire siblings, we have gathered together a visual sampling of some of the better known relatives of 'Mowgli', to give an accurate overview of his family ties and have included a short list of those for whom we do not have images, but which were none-the-less significant contributors to the ongoing development of this colour variety within the Persian breed. 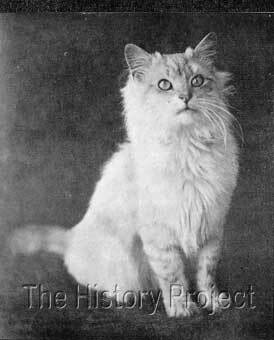 Among the other other famous sire-siblings of 'Mowgli' can also be counted: 'Silver Tod Sloan', 'Silver Mist', '(The) Silver Squire', '(Lord) Silverhair', 'Silver Owl', 'La Poupee'and 'Brookville Fluffy'. Although he must have stood at stud, there appear to be only four cats of record for his progeny. In what appears to have been his most significant litter; born to Miss Chappell's 'Victoria' on 17th April, 1899 came the silver male 'Cambyses'2 and the female 'Tamina'2, both registered as Chinchilla's. 'Tamina' was sold to Mrs. C. Reay Greene, while 'Cambyses' was fortunate to fall into the hands of the experienced judge and historian, Miss Frances Simpson. In due course, 'Cambyses' became a much loved pet as well as a stud. He lived in the residence as he did not spray and had a most amiable personality. Miss Simpson valued him for this, but also for his coat, which although barred when young, began to clear out as he matured, and in due course, she placed him at stud. Although she was not keen on showing him, on the few outings he finally did make, he not only competed successfully in his class, but went on to produce very clear-coated progeny of considerable note. 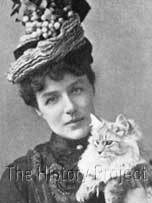 Left: Miss Simpson with 'Cambyses' as a kitten. Right: 'CAMBYSES as an adult. 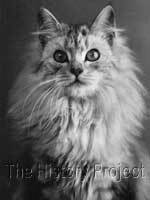 In another litter born 28th June, 1899 was born 'Bullina'2, a Shaded Silver female bred by Miss Jessie Thwaites, and originally owned by Mr. Hepworth Thwaites before becoming the property of Mrs. Harber. Lastly, there also exists a partial record of a male, named 'Silver Wand'2, owned by Mrs. B. Case, with his parentage given as by 'Mowgli' out of 'Ladykins'. So it is through his daughter 'Bullina' and his son 'Cambyses' that 'Mowgli' is perpetuated. Stud Advertisement for 'SILVER LAMBKIN' in which 'MOWGLI' is listed as one of his noted sons. The development of the 'Chinchilla' as a variety has few parallels, except perhaps with that of the Blue Persian. Both were initially bred with the goal for purity of colour clearly in mind. 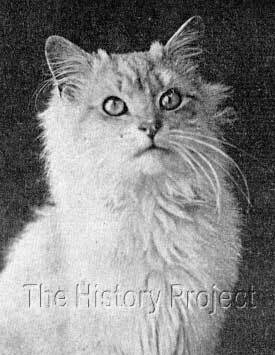 But the Chinchilla or Silver Persian of the early twentieth century was developed from a rather limited gene pool, while the 'Blue' Persian was developed from a much greater base of genetic diversity. The 'Blue' could also pool its single-colour resources from a variety of other colours and patterns, which continued to be supplemented with new and outcrossed bloodstock from time to time. 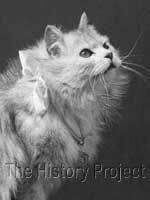 Chinchilla cats have carved for themselves a special place in the heart of cat fanciers. Their long, flowing, stunningly beautiful clear silver coats, delicately tipped in black, gives them a sparkling and ethereal presence, which in reality is unmatched by any other breed or variety. Coupled with this, their large round and expressive emerald green eyes, accentuated by an outline of black mascara and an expressive face punctuated by a brick red nose leather finely outlined in black, makes them vision of loveliness that is truly unique. 'Mowgli', as the direct offspring of 'Silver Lambkin' was simply on the first rung of a very high ladder that reached for the stars. We, are in a privileged position to view him from a historical perspective, like the proverbial 'Jacob' about to descend that ladder. Only in this instance, we have the added benefit of being able to look back 120 plus years, viewing the process, progress and great strides achieved in creating the Silver Persian of today. Even now, when we view his sweet open expression, firm chin and round eyes outlined in black, we can perceive an image of what the future would hold for the breed. We do that with the benefit of 'hindsight', while those that worked to create and preserve the breed in those days, did so with considerable faith and 'insight'.